Bradley Systems has always stood for safety and efficiency, and with the introduction of our EZFlo system, we have taken that commitment one step further. If you enjoy watching over your employees to make sure they mix and dispense cleaner concentrate correctly then you can stop reading right now, because EZFlo isn’t for you. Bradley Systems has introduced EZFlo for a simple reason: mixing and diluting cleaners is a pain – and Bradley is all about removing pain for our customers. 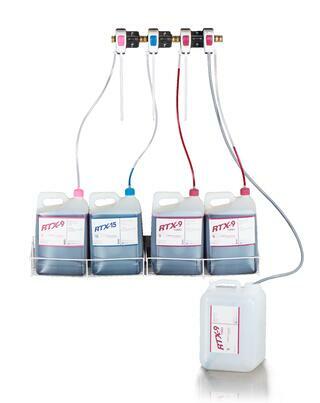 EZFlo is simple cleaner dispensing system that uses automatic mixing to control dilution and dispensing, so that your employees aren’t standing over five-gallon buckets with paint stirrers or wasting product (and money) with incorrect dilutions. Traditionally, employees had to be trained to properly dilute cleaner concentrates and use them correctly. EZFlo eliminates this wasted time by simplifying the preparation and dispensation of these products - just hook up your cleaner concentrate to the system and dispense ready-to-use solution for your application. Because the ratio of cleaner to water is preset, you get the exact cleaning strength you need every time. Not only does this simplify training and product preparation, but it also just makes operations a whole lot faster. You want the burgundy stuff? Press the burgundy button and out comes your perfectly pre-mixed cleaner. You want the pink stuff? Press the pink button. So if your business has to clean on a day to day basis, then you need EZFlo, yesterday. This system is for automotive dealerships and car rentals, it’s for fleet maintenance centers, it’s for any sort of fleet or industrial facility that requires regular cleaning. Keep your cleaning simple, and get it done faster with Bradley Systems' EZFlo. Learn more about EZFlo here.